"Despite facing intimidation, women across the world are increasingly standing up to these injustices and demanding their rights be respected, joining together online and taking to the streets to push for change." As we look forward to this year’s International Women’s Day, I wanted to share some reflections on two recent Elders’ visits which each highlighted the scale of the challenges facing women at every level in society and their determination to assert their rights. 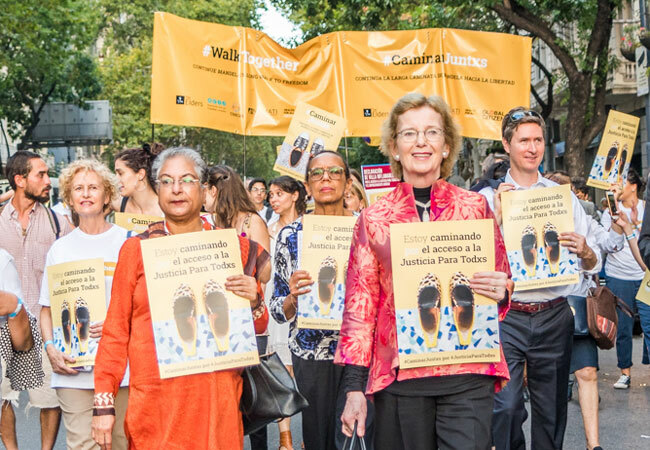 Two weeks ago, I was honoured to join grassroots justice defenders in Buenos Aires to demand equal access to justice for all, as part of The Elders’ #WalkTogether campaign. 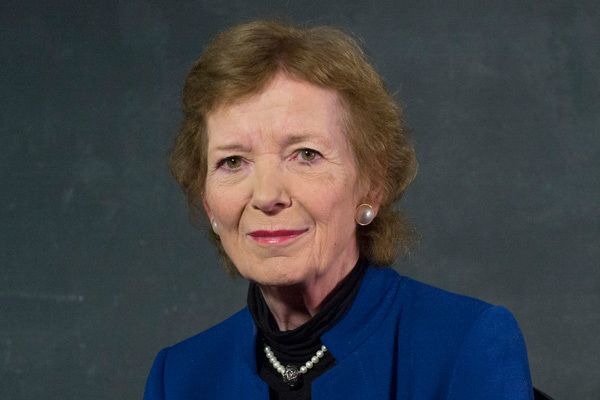 Mary Robinson and I walked alongside many incredible women and men, who had joined together to ‘tip the scales’ of justice towards those who need it most – including women, minorities and other marginalised groups. Ten years ago, the 2008 report of the Commission for Legal Empowerment of the Poor identified 4 billion people as lacking access to justice. Progress has been disappointingly slow since then. For a woman experiencing violence or discrimination, the law can provide much needed protection, if only she can access it. 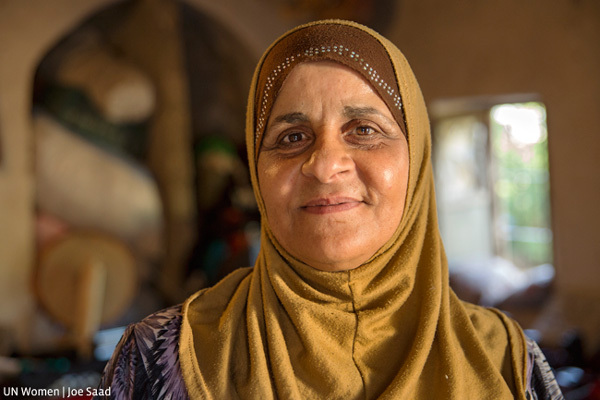 Fragmented legal frameworks, lack of mechanisms for enforcement and financial barriers all stand in the way of a woman being able to address a violation of her rights. In Pakistan, where I began my career providing legal aid to vulnerable women, an estimated 1,000 women are killed every year in so-called “honour killings”. In Argentina, a woman is murdered every 30 hours. Across the world, justice systems continually fail to protect victims or hold perpetrators accountable. Following the event in Buenos Aires, I joined Kofi Annan, Martti Ahtisaari, Lakhdar Brahimi and Ernesto Zedillo for the first official visit by The Elders to Saudi Arabia. Our focus was on the regional security crises, which can only be addressed affectively if there is dialogue between Saudi Arabia and other regional powers, but it was impossible to ignore the domestic social changes underway in the Kingdom and their impact on women. The changes to Saudi Arabia’s policies on women are welcome and long overdue, but there is still much further to go before women are treated as equal citizens in the eyes of the law. The same applies all over the world. And it heartens me that, despite facing intimidation, women across the world are increasingly standing up to these injustices and demanding their rights be respected, joining together online and taking to the streets to push for change. During 2017, movements gained global momentum and women’s rights activism reached centre stage. #MeToo and #TimesUp dominated both social and mainstream media, and conversations about sexual harassment were beginning to be taken seriously after decades of disregard. Online activism was matched with women taking to the streets around the world in their thousands to demand that their rights be respected. In January 2017, an estimated 3 million people across the United States took part in a historic Women’s March – and these protests sparked similar marches in 84 countries across the world. Throughout the year that followed, women in movements large and small stood up for the right to equal treatment, bodily autonomy and a life free from violence. In India, women cried “I will go out” in response to a series of violent attacks in public places, in Poland, women wearing all black marched again to protest proposed legislation that would further restrict access to abortion, and in Argentina, the Ni una menos movement galvanised thousands of women to demand action to prevent femicide. This year’s International Women’s Day celebrates the women driving this increased global momentum, with the theme “Time is now: Rural and urban activists transforming women’s lives” and encourages us to seize the opportunity to transform this global outrage into systemic change. As we celebrate achievements so far, and while celebrating the 20th Anniversary of the UN Declaration on Human Rights Defenders this year, we must continue to build progress, supporting brave women’s movements and human rights defenders, raising their voices, in order to achieve the monumental changes needed to ensure a freer, fairer future.